Our special Saturday demonstrations showcase artists from Mexico. Efraín Fuentes and Silvia Gomez are from San Martín Tilcajete, Oaxaca, Mexico. Their tiny village is situated in a valley not far from the ancient Zapotec ruins of Monte Albán and Mitla. Many of the families in the village carve whimsical figures out of wood. Their inspiration comes from the twisted wood itself as well as religious, decorative and traditional designs. 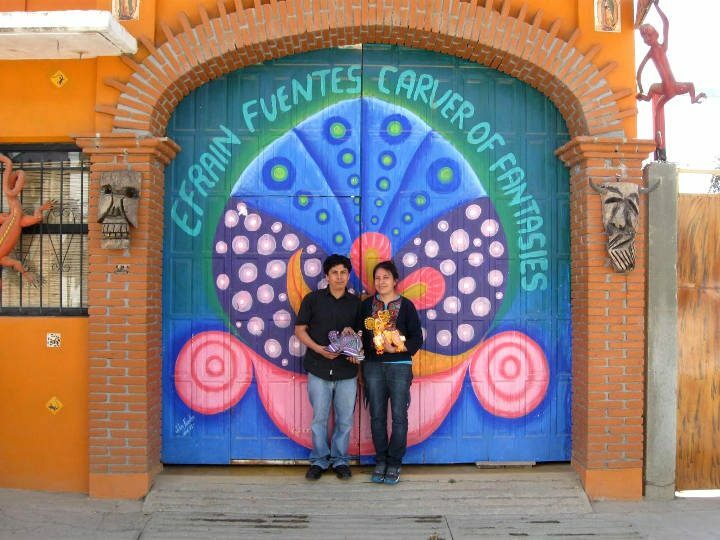 Efraín and Silvia represent a new generation of carvers and painters from this Oaxacan village. This generation of carvers and painters are not only continuing their family and village traditions, but they are incorporating ancient Zapotec designs and new sculptural concepts. Efraín, in particular, enjoys the challenge of carving complete sculptures from the same piece of wood in addition to the traditional method of nailing various pieces of wood to complete the sculpture. Silvia spends hours painting intricate designs on the carvings. Typically the painting process takes longer than the carving. Their pieces are collector’s items and they constantly work on commissions and ingenious new pieces that are one of a kind masterpieces.